Todays primary concern is for Loose Wet avalanches on all aspects & elevations. Intense sun & temperature inversions will allow for a lot of melting & sublimating of the snowpack, which can lead to unstable surface snow conditions. Restrict your afternoon riding to areas of low consequence. With temperatures hovering near 40F (4.4C) this afternoon we can anticipate melting snow to exacerbate Loose Wet avalanches. An overnight temperature inversion has the Leavitt Snotel reading 32F at 6AM, while Sonora Snotel is 9 degrees colder. Look for the obvious clues that surface snow conditions are changing throughout your travels. Daytime heating will melt & sublimate the surface of the the snowpack. 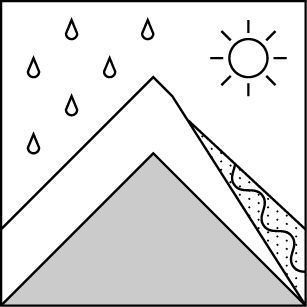 A temperature inversion could make upper elevation snow conditions wet & loose. Where overnight freezing temperatures have occurred expect a surface melt-freeze crust of varying thickness. In the alpine we found near surface facets just below a 2cm melt-freeze crust which could be touchy but very shallow. Snowmobiles were spitting loose wet snow from their tracks while climbing in steeper terrain but no slabs were failing. Loose Wet avalanches will be very likely this afternoon as we approach 40F. Compression tests were repeated and have shown a density change 32cm deep, taking a hard force to initiate fracture. ~3/14 Wind Slabs have stopped growing due to calm winds. No new recent avalanches were observed. ~3/16 Repeatable CTs, conducted during an Avalanche Awareness Class, show a density change 32cm deep but it takes a hard force to initiate fracture. Loose Wet avalanche activity was beginning to appear, in the afternoon, on slopes that get direct sun. Many riders were observed stepping-out into larger terrain with no reports of negative consequences. Continued sunshine & light winds with gradually increasing temperatures each day. Temperature inversions are becoming more common at night & we will barely get to freezing this morning in near and above treeline areas. Tuesday evening is the next chance for precipitation, as two consecutive storms could bring high elevation snow to the Sierra crest. Rain is likely in lower valley areas with a fluctuating snow line between 6000' & 7000'. Temperatures: 41 to 49 deg. F. 19 to 24 deg. F. 42 to 50 deg. F.
Temperatures: 34 to 40 deg. F. 16 to 21 deg. F. 34 to 40 deg. F.